Latest innovations offer computer-aided, navigated implantation. 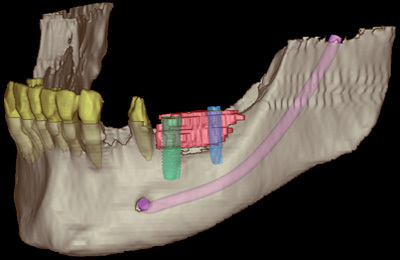 The whole treatment is based on CT-diagrams of the part of the jaw in question, planning every step at the computer. Quality fo bone and anatomic specificalities can thereby be considered before the actual intervention. We then decide together what treatment fity you best. Even before the implantation these plans can serve the dental laboratories to already craft your dental prosthesis. In this way, our patients can receive their final prosthesis at the end of the intervention.